We’ve officially lived in our place for almost 9 months. And let me tell you, time FLIES. I have so many ideas as far as decorating goes, and I’ve finally committed to tackling a few projects – one room at a time. I bought a mid-century modern nightstand at Target (here’s some similar ones here, here and here). It sits on Fritz’s side of the bed, due to limited space on mine. So because I didn’t want to spend money on one for me, and because Fritz is tired of me reaching over him to grab my glass of water at night, I decided to make my own! First, measure the area. I wanted my nightstand to take up the space between my bed and the wall with little to no space in between. Grab the wood you’ll be using. 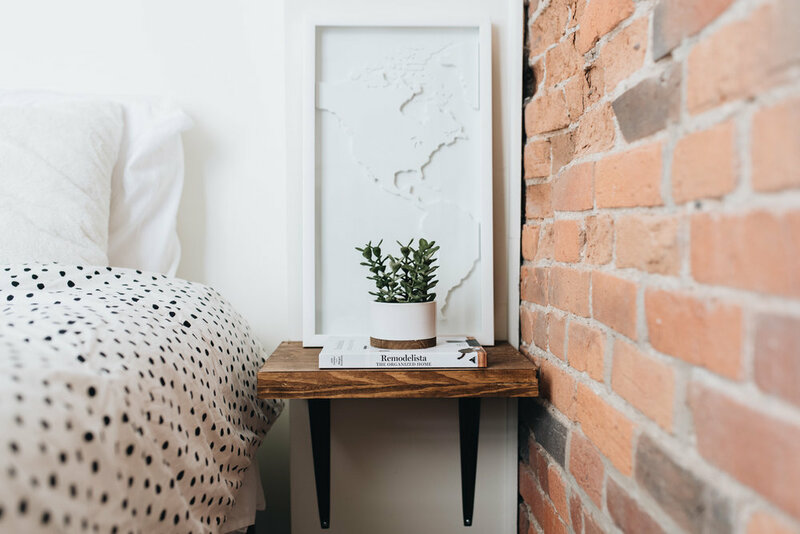 I’d recommend layering two pieces for a thicker, more sturdy nightstand. I picked mine up from Home Depot and went with plywood because it was more affordable. But the type of wood you use is completely up to you! Because we’re renting, I was okay with using a lower quality wood. Glue wood together with a reliable wood glue and let cure. Once the glue has dried, stain the wood with your preferred color. Attach brackets to shelf and drill into wall.